So the daughter turned 7. And it seems like all of a sudden she started talking about a tree house. Not sure where she got it from. We may have seen one or maybe a friend at school mentioned theirs. For all I know she saw it on tv. But no matter, cause she planted the seed in my brain. I had a club house as a kid, built around trees and within trees but nothing actually in a tree. So I wanted her to have an actual Tree House. Now, I do a lot of real estate so I know about houses. And I’ve done enough work on my rentals to know a lot about construction. Heck I’ve even done some framing. So I know I can do it. Just have to apply what I know to a slightly different setting. The first step was a lot of research. I looked at tree houses on the internet, and found a few sites that were helpful. I read some books of plans, checked out Youtube, even looked on Pinterest (which was mostly crazy dream homes- doesn’t anyone post normal tree houses on there? I mean besides me, cause I am gonna). Most of the plans I saw used one tree with a deck built around it. Unfortunately I don’t have one tree in my yard that is thick enough to support the weight, much less having the right placement of branches. But I do have 2 trees so I looked for plans for 2 trees. I found a very helpful link on Instructables which had a plan for 3 trees that I slightly modified. Then I took some notes, drew some basic sketches, and got started. Height is an issue- you want it to be high enough to be fun but not high enough so that you can’t actually do any work on it. I chose around 8 feet up- just high enough for me to still be able to reach it. 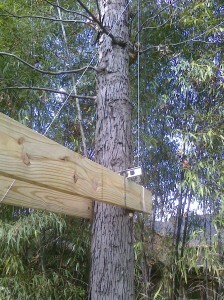 I measured the distance between the trees and got two 2 by 10 treated decking boards and some long 3/4 inch lag bolts. 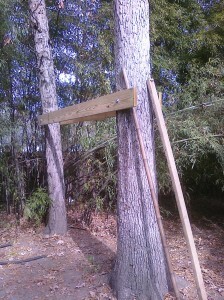 Because to support the weigh of the house, I had to place it between the two trees. Each board was lag bolted to the tree so that there would be two supports, not just one, and the deck would sit across the two boards, helping to stabilize the whole thing. 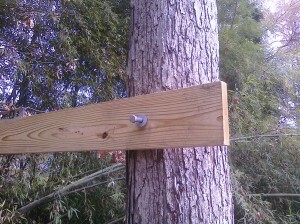 Washers go between the boards and the tree so as to minimize water hanging around those spots. I was doing this myself (well not really- I had my 7 year old daughter helping me, for what it’s worth) , so I used ropes to pull the boards into place and tied them off. Also I used old 2 by 4’s to add support underneath while I drilled the pilot holes in the tree. The tree has to be drilled. But I used lag bolts that do not go all the way through the tree and when I was done I left the whole thing alone for a few weeks so the tree could heal. Killing the trees would not be good for supporting a tree house. 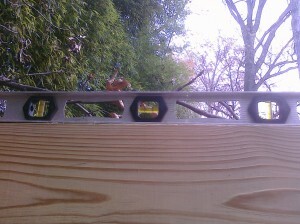 It was also important to make sure the boards were level both ways- across the top and level with each other. So that the decking would be level as well. Measure twice, cut once is rule number one but Rule Number 2 should be Keep it Level- check it constantly. That’s Phase One. That was the easy part, trust me. Compared to Phase Two, that is. On to Phase Two- The Base!